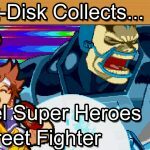 Insert Disk collects X-Men vs Street Fighter for the Sega Saturn. 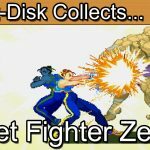 Welcome to Part 8 of 11 of this Sega Saturn Capcom Fighting games mini series. 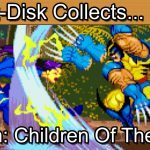 Part 8 sees the launch of the X-Men vs Street Fighter for the Sega Saturn. Greetings collectors and welcome to today’s retro game review. 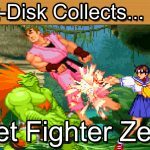 You join us in part 8 of the Sega Saturn Capcom Fighter Mini series. 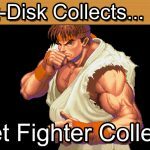 We’re taking a look back at Capcom’s fighting games for the Sega Saturn. Expect Street Fighter. Street Fighter Cross-overs. Marvel and Darkstaklers all battling it out on behalf of Capcom. 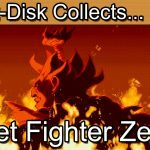 In the last episode we saw how Capcom were consolidating their Street Fighter series in the Street Fighter Collection. A rather neat 3 game package of the old and the new. By November 1997 The X-Men universe and Street Fighter universe were both well established with gamers. Capcom decided that it was time that they squared up to each other in a single game. X-Men Vs. Street Fighter. It’s perhaps best to start with the physical release of the game as it is somewhat different to the normal Capcom released. Although you can buy as a single game edition the game was also used to promote the expanded 4mb memory cartridge for the Saturn. The extra memory enabled smoother graphics with extra frames of animation and just all out helped push the capability of the system.The game case and manual are all to the fine standard of the Capcom Saturn releases and overall this feels like a collection in itself. Out of the box expect 16 characters from the world of Street Fighter and X-Men. You could now have epic line ups such as Cammy vs. Juggernaut. The specials are in here as well as an excellent combo system. What really set this one apart though was the tag system. This was a 2 on 2 affair. Select your team of any two of the characters and face off against your opponents. When things start getting tough against a certain opponent switch out and use your team mate. This mechanic in itself drastically changed the way we played Capcom fighting games. It provided variation and more tactics than previously available. The other element to notice here is the scrolling convention. Up until this point in time all Street Fighters games had no vertical scrolling. No matter how high you jump or were thrown in to the air the camera would remain locked. This was in stark contrast to both the Children of the Atom and Marvel Super Heroes lines of games. Interestingly X-Men vs. Street Fighter opts for the vertical screen scrolling as well as character designs more in line with the Marvel games. 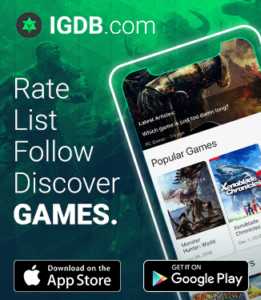 So in fact although the game is titled X-Men vs. Street Fighter the game is very much designed as Street Fighter characters in a game using Marvel gaming conventions. This soon becomes apparent as the game is brighter and bolder than the Zero series, moves are more exaggerated and the game feels as if it should fit in to the Marvel universe of games. Although a bit of a mash up of styles its incredible how well the two Capcom worlds unite. The game feels very well balanced and it’s certainly a triumph for the first Vs. game in the series. Its importance in gaming history shouldn’t be over looked. This was the origin of a whole branch of games for Capcom. We would see Marvel Super Heroes Vs. Street Fighter, Street Fighter Vs. Tekken, Marvel Vs. Capcom and even Tatsunoko vs. Capcom. 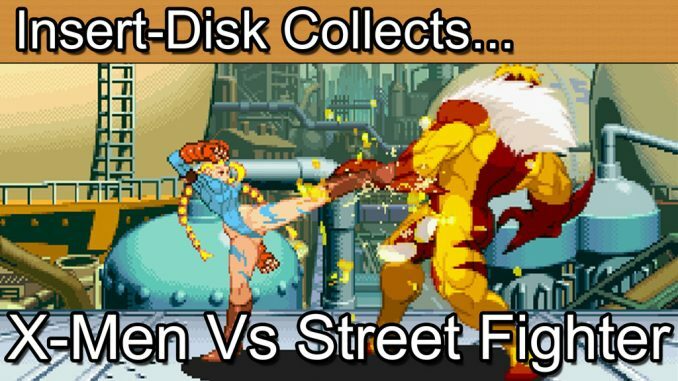 X-Men vs. Street Fighter was a game that really spoke to gamers and Marvel fans. It delivered the excitement and energy of the Marvel style with the sophistication and experience of Street Fighter. This truly is a best in class game on the Sega Saturn and I can’t recommend it highly enough. 1997 was coming to an end though, we had seen excellent outings from Street Fighter and Marvel. There was however a third voice, still wanting to be heard in the background. Away from the spotlight a horror was calling to gamers. By April 1998 Capcom unleashed Vampire Savior: The Lord Of Vampires on the Sega Saturn. Join me in the next episode as we investigate the game much of us know as Darkstalkers 3.